Zilberman Gallery, Berlin is pleased to announce the exhibition Interrupted Halfway Through by Istanbul based artist Burçak Bingöl. This exhibition marks the artist’s first solo presentation in Berlin. The opening will take place on April 24 at 6 p.m. and the press preview at 11 am on the same day. Burçak Bingöl carries various fragments from Istanbul to Berlin and makes a visual experiment by superposing time and space. While creating a psychological as well as a political landscape on forgetting and remembering, Bingöl’s oeuvre scrutinizes hidden as well as fading and/almost lost memories. Her show resembles an excavation site, focusing on the social amnesia generated by state control as well as the syncopated connections between the East and the West. The interest in stratification of time in her work—especially linked to the city of Istanbul—is inspired by Tanpınar’s ideas on time that has strong references to Bergson’s notion of durée. By using the concept of Yekpare time—an understanding of time that is undividable that has no calendar and no unit to measure but only the memory—Bingöl imagines a re-construction, focusing on the ruins of a forgotten past. 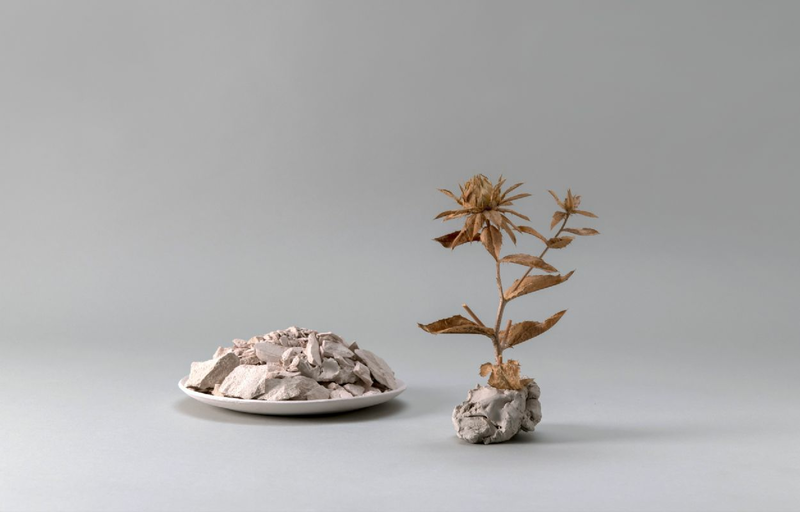 The exhibition features displaced urban textures like stones and plants as well as ceramic works. With a P.hD. in ceramics, Bingöl experiments with the methodology and grammar of this material’s cultural associations. How can collective memory be mirrored with ceramics that fracture might occur at anytime? Can failure be the starting point of a new fiction? Channeling energies of another space, Bingöl carries a piece of wall of the Istanbul gallery to Berlin, belonging to the renowned art-nouveau style Mısır Apartment. The thin layers of the work Displaced Gallery Wall or A Fragmented Memory of a Rose, bring the New Wave—the recent (cultural and/or political) immigrants that came from Istanbul to Berlin—into mind. How do we engage with the new when we are displaced? Recalling the remnants of a shipwreck revealing a forgotton past, Cargo offers a set of new possibilities that bridge past and present, formalism and intuition, concept and materiality. A display that not only blends personal and social history, but also blurs the line between the real and unreal; fiction and failure. The exhibition is accompanied by a catalogue with contributions by Sevinç Çalhanoglu, Lotte Laub, Wendy Shaw and Simon Wachsmuth. For more inquiries, please contact Göksu Kunak, goksu@zilbermangallery.com. Copyright © 2010 Galeri Zilberman. Tüm hakları saklıdır.